In the week since I photographed this caponata for the blog, photo shoot regret has been creeping in (worse than usual). 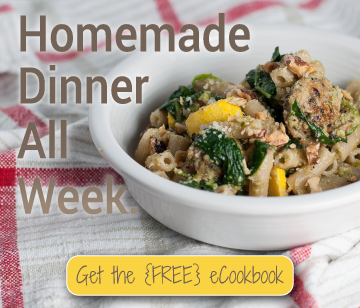 I don’t really like to talk about photography in recipe posts, because most of you are here for the recipes, but this issue has a relevant point. The “problem” with fig and fennel caponata, with all its sweet and sour, briney and acidic flavors, is that it plays well not just on crostini, but anywhere you might use a chunky tomato sauce or Mediterranean dip. On pizza (without much else), over pasta, decorating a huge platter of hummus, or, as I unconventionally chose, over a big bowl of fragrant basmati rice which, along with creamy feta, helps to balance the bold flavor profile of the caponata. Great, right? A multi-purpose condiment/entrée that also happens to be healthy? Yes, but I’m just worried I chose an obscure option for the photos, and that you might not fully realize its delicious splendor because you think it’s weird that I piled it on top of a bowl of rice. At the very least, arborio would have been more fitting. Such is the creative process, though, so do me a favor and use your imagination to envision how great fig and fennel caponata will be over little garlic crostini next to a glass of wine at your party this weekend. Or on your couch. You know I’ll be choosing the couch option. My honey just got home from a week of work across the country, and we have big plans for ourselves featuring homemade lasagna, all the wines (but actually approximately 2.5 glasses), and a chocolatey pie that you’ll soon learn all about. And maybe a movie. I stayed up past both Steve and the dog last Saturday watching not one, but two, movies. Ummm, what’s the big deal? It seems we’ve discovered a genre that will keep me engaged, regardless of whether that’s a good or bad thing, instead of sending me running to get some work done. I like to think of it as intellectual thriller, such as the ones I watched, Now You See Me and Catch Me If You Can. The kind of movie that is fast paced and gets you thinking, without much gore just for the sake of having it. My husband will personally thank you for leaving your recommendations below. 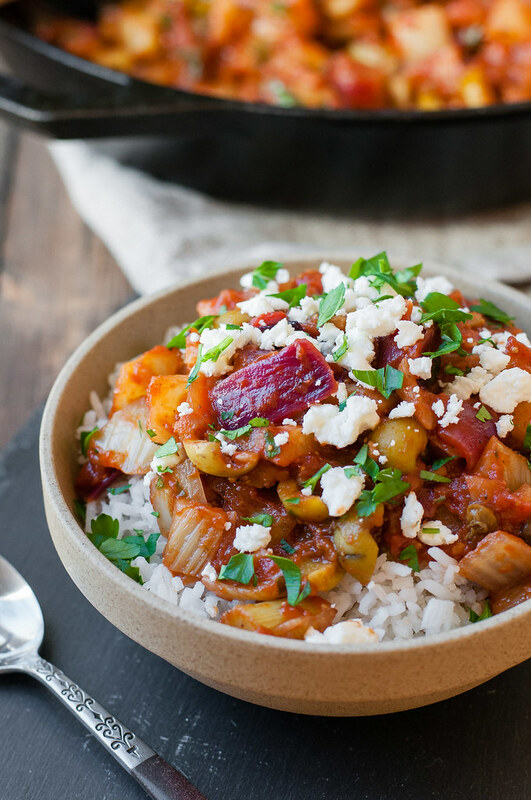 If you’re familiar with caponata, you know that, while there are myriad variations, it typically includes eggplant, the perfect vehicle to soak up all those other flavors. 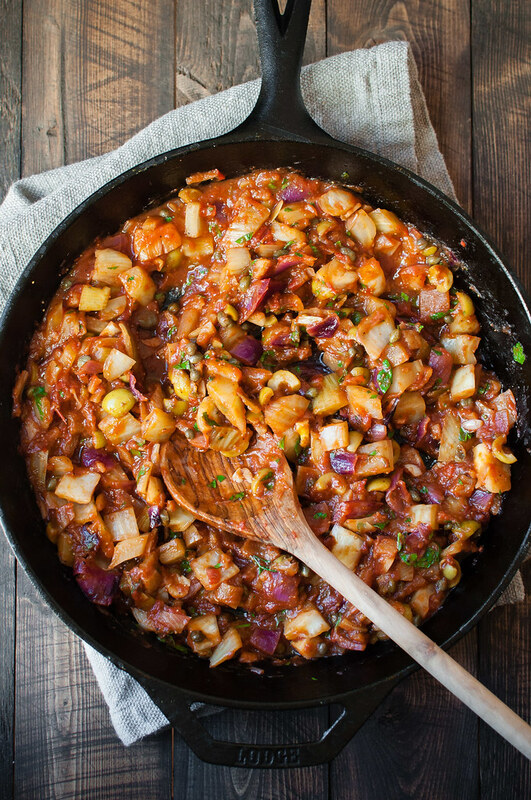 My first experience with caponata, though, was via Ina, and despite my love for eggplant, I don’t think I’ll easily stray from the slightly crunchy bite and earthy brightness of fennel and chunky red onion in this recipe. I’m made just a few minor tweaks, mostly reflecting that the Contessa’s version was a tad sweet for my liking (I received similar feedback at the family function to which I brought it) and that it just begged for some cinnamon. Is that sacrilege? I don’t know, I’m German, but feel free to chide my unorthodox approach in the comments. Also, let me know how you take your caponata! Bonus points if you put it on a pizza and snap a pic, because that’s exactly what I’m craving right now. 8 large dried Calmyrna figs (see notes; ¾ C diced), stems removed, diced ¼"
Heat olive oil over medium in a 10 inch, high sided skillet. 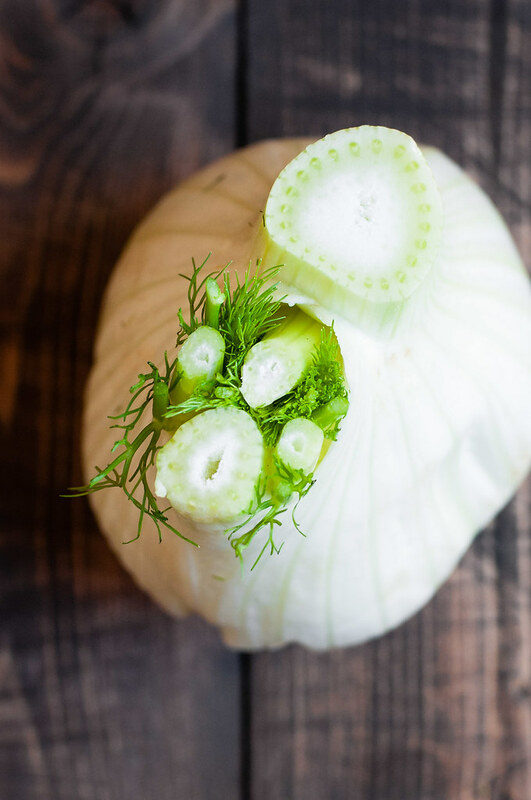 Add onion and fennel and cook until softened but not brown, about 10 minutes, stirring occasionally. Add garlic and cook for another minute. Add vinegar, tomatoes, figs, sugar, capers, olives, lemon zest, cinnamon, salt, and pepper and stir to combine. Raise heat to bring to a vigorous simmer, then reduce heat and simmer gently until thickened, about 10 minutes. Remove from heat and stir in lemon juice and herbs. Serve warm or cooled to room temperature, with crackers or crostini as an appetizer, or over rice with plenty of feta as an entree. 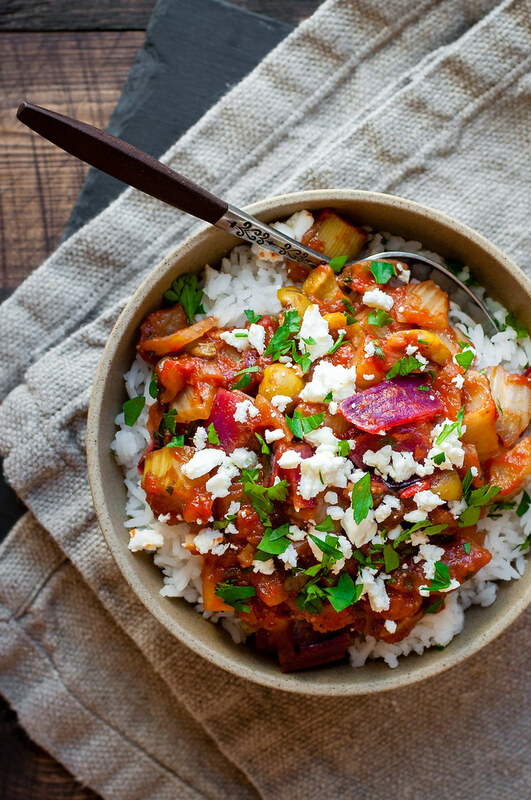 If making the caponata ahead, store in the refrigerator for up to a week. Feel free to substitute another variety of dried fig. Calmyrna figs are large, so you may need 10 to 12 of smaller types. 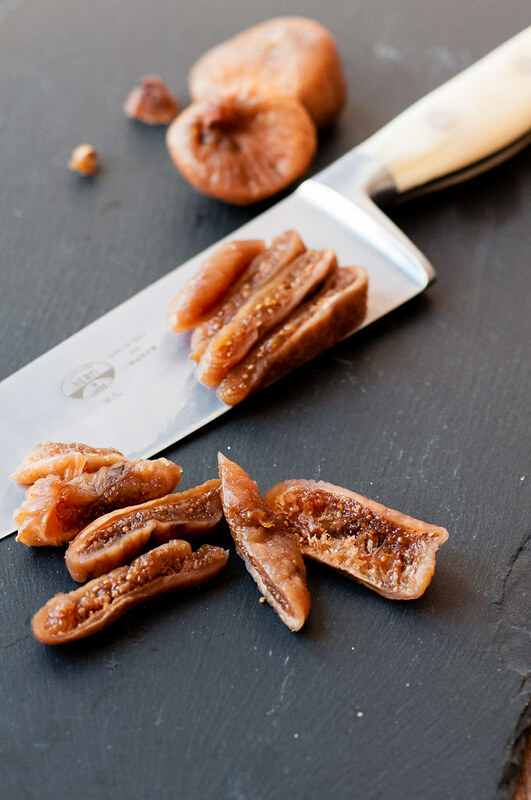 In total, you should have about ¾ cup of diced figs. 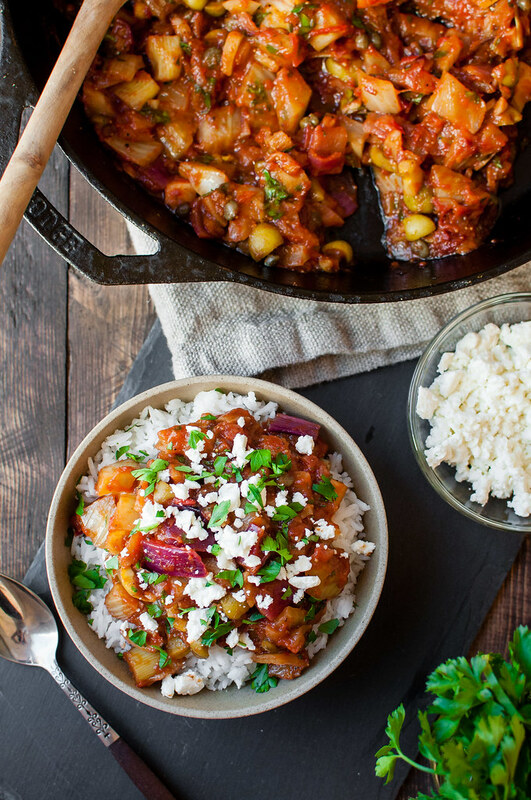 If serving the caponata as an entree, note that it's very flavorful. 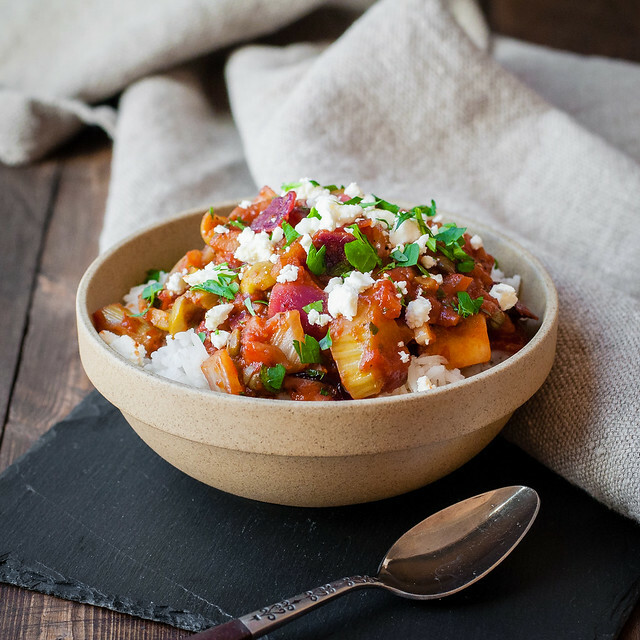 Serve light portions with plenty of rice and feta to balance the acidity and sweetness. The caponata would also be great over pasta with plenty of parmesan! So often I learn something new from you. I’ve never heard of caponata, so I thank you. What’s not to love about figs and fennel? But I wonder, could fresh tomatoes work? I don’t buy canned any longer, and do so love the way fresh tomatoes cook down quickly in a skillet. Your rice photos are lovely, and I can almost taste this dish with the rice, but I’d love to eat it on crostini too. Thanks for teaching me something new! That is such a compliment, Kathryn. Teaching through NCK is one of my main objectives for the blog. Fresh tomatoes would definitely work: I would give them a quick roast and peel, then crush by hand. So a little more work, but probably even better flavor! Thanks Teffy, and yes they do really well! You get all the flavor without the sometimes offputting texture of dried fruit. You really should credit Ina Garten, this is exactly her recipe. Hi Jodi, if you read the blog post, you would notice I did just that. It also explains how it is actually not her exact recipe. Thanks for your observation!